Why is Honda's Certified program the best in its class? Every Honda we build is a product of innovative engineering and quality manufacturing. 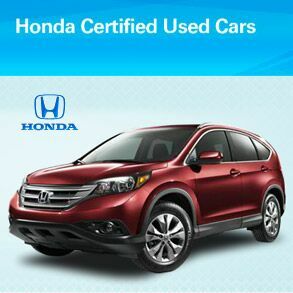 And only well-maintained late-model Hondas are eligible for certification. Our certification process includes an exhaustive 150-point Mechanical and Appearance Inspection to ensure that each vehicle meets the highest possible standards. Honda-trained mechanics scrutinize all major vehicle systems, including brakes, engine and drivetrain, steering and suspension, tires, wheels, exhaust system and vehicle interior and exterior. We replace any component that does not meet our stringent standards with Genuine Honda Parts, or restore it to "like-new" condition. We take pride in each step of our certification process so you'll be completely satisfied with your Honda. A copy of each car's Vehicle History Report will be kept at the Honda dealership and will be available for you to see. Or you can always get a free vehicle history report online. Then view important details about the vehicle, including your free third-party vehicle history report. * Body corrosion and some emissions components and seat belts are covered longer. See your vehicle's original warranty information booklets for specific items. † If the new-car limited warranty has already expired upon delivery, the 12-month/12,000-mile coverage starts on the day you buy or lease the car.